"Part magician, part chameleon on the mound. He can drop his arm like Dan Quisenberry one pitch, then come back like Roger Clemens on the next." 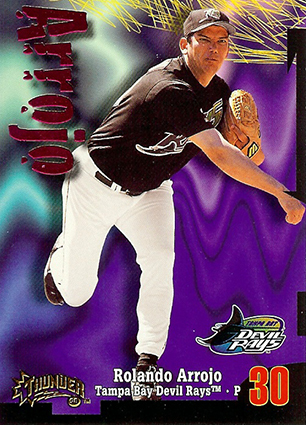 With a fastball clocked in the low 90s and a nasty slider, Arrojo hopes to have the same success in the majors in '98 as he had in the 1997 Arizona Fall League (5-0, 1.38 ERA).